Things have been good and then they have been bad and then good again. So... normal life. We recently headed south for a quick Kansas fix. Whilst there, we held babies. We played with the other nieces, too, but they don't hold still long enough for me to take a picture, so here's more baby-holding. Monday morning I woke up at 5:30. It was one of those sleepy, coming-slowly-to-consciousness "Wait, what time is it?" before jolting upright and realizing you didn't hear your alarm or never set it or something, the result being you overslept by nearly an hour and left your friend standing alone in the dark at 5 a.m. I felt terrible. She insisted that it was fine, she needed a day off anyway, blah blah blah, lies lies lies to make me feel better. It was too late to run, so I decided I'd go ahead and get a little work done before rousing the rest of the family. I went downstairs to make my coffee. Coffee maker goes on strike, won't dispense a single solitary drop of caffeine-nectar-goodness, and how do I keep breaking coffee makers? I do not have fancy tastes, or the need of special gadgets or anything. I use regular-people drip coffee makers (Dear internet people who spend a curious amount of time each day preparing a liquid that ends up tasting about the same as the stuff truckers buy at gas stations: get a hobby. Perhaps a high-maintenance tiny dog? ), and regular-people coffee (cheapo coffee beans from Aldi that I do, admittedly, grind myself because cockroaches are gross), so why does my coffee maker keep breaking? Anyway, after learning that I would not be getting any coffee, successfully suppressing the urge to rend my clothing and tearfully ask the universe why bad things happen to good people, I decided that I would move on, and get to working. I booted up the computer, and there was no internet. No internet means no work. So at 5:50 a.m. I gave up on Monday. 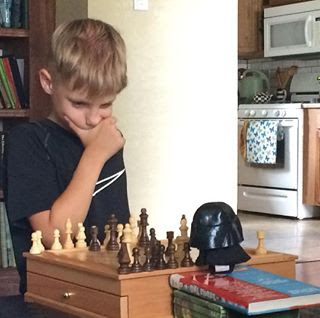 and Atticus will play chess with tiny Darth Vader when Derek isn't home, because Atticus and Derek love chess but I do not, because it is boring. Yesterday afternoon Caedmon began screaming and running around even more than usual. Bees again. Atticus had those two bee stings last month, Caedmon got two yesterday, and Adelaide claims to have seen a line of bees going in and out of a hole in the ground. Do bees nest in the ground? I thought they built their hives up in, um, you know, places that are not holes in the ground. It turns out neither of our boys are allergic to bees, so today Caedmon is just sporting an extra welt on his forearm and one ear is about 20% larger and weirder looking than the other, but who cares because ears are super weird-looking anyway. I know this because I spent a solid ten minutes staring at one yesterday, trying to scrape a bee's stinger out of one of those folds of cartilage that make up the outer ear. The pinna? See above gif yet again. Atticus likes to pedal this knife-sharpening contraption that my grandparents have at their house. You push one of the pedals- the other being currently non-functional- and the stone spins. Atticus pushes one of the pedals, and Grandpa inevitably whips out a pocket knife to sharpen, and tells us about pedaling the tool as a boy, then as he got older using it to sharpen mower blades, and boy, wasn't that a pain! For that first batch of bad stuff - is it possible you lost power in the night? Why would all those things decide to quit working at the same time? Or maybe the internet of things got taken over by Daleks. Anyway, that sounds like a difficult start to the day. Yes, bees/hornets/wasps can live in the ground. Woe unto him/her/it who pushes the lawn mower over such a hive. There's probably a way to DIY get rid of them, such as waiting until dusk and spraying poison into the ground. I let my husband handle such things because I am a wimp.